We had so much fun with our Rainbow Ice Tower that I wanted to think of another way to play with ice. It's no secret that we love playing with things that glow - so my mind immediately went there. My first attempt at glowing ice wasn't great (our Safe Glow Water does not glow brightly when frozen). But then I hit gold. 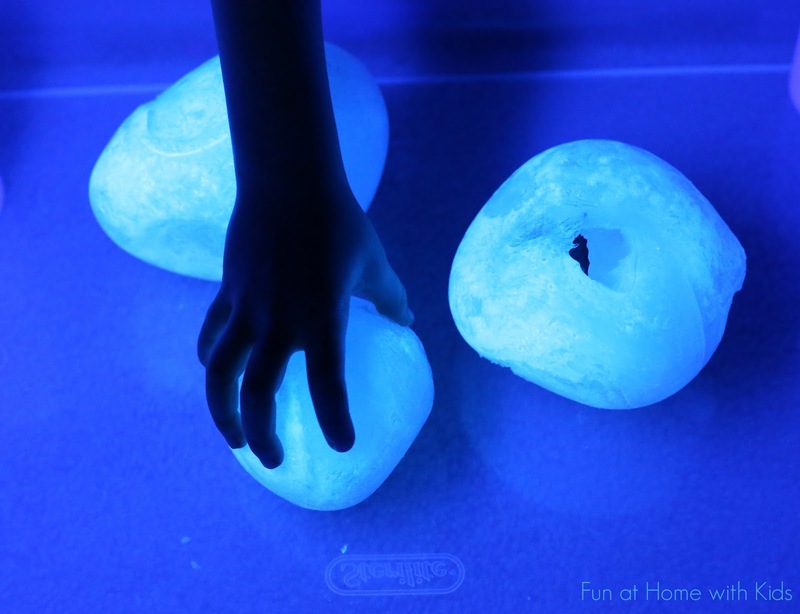 The coolest thing about these glowing ice eggs is that you literally can't tell what is inside until you melt enough of the egg that a part is revealed. This added a whole other dimension of mystery to something that is already so much fun! Here she's freeing her sting ray! How cool do these look when they are half "hatched"? They looked like tiny glowing moons with interesting patterns and craters. First you will need to (patiently) shove the items into an empty balloon. Depending on the dimensions, this may take a fair bit of patience and finagling (butterflies are tricky, but I like a challenge). Fill two squeezy bottles with diet tonic water. Why diet? We have played with tonic water before and the regular kind is pretty sticky and stinky. The diet was WAYYYY better. So we recommend that though regular tonic water will also glow under a blacklight (so long as it contains quinine). Once your loot is inside the empty balloon, blow it up quite a bit with air (more than you need to fill with liquid). Then insert the spout of the squeezy bottle into the balloon. Use your fingers to hold the balloon closed around the spout. You'll lose a little air, but you shouldn't lose too much. Squeeze the diet tonic water into the balloon. We did between 1 and 2 squeezy bottles of diet tonic water into each balloon. Once the balloon was full of diet tonic water, I carefully let out any extra air. Once you only have tonic water left in the balloon, tie off the balloon and place it in a freezer for several hours (6 or more). Hi, I was wondering do these glow in the dark too? or just with a black light? Would be interesting to burry them in the snow and have the girls find them at night. Oh, thanks! I didn't click that link to put 2 and 2 together. Your book is on my wish-list! Thanks for putting so much time into experimenting and sharing your findings.